Franchise or as I prefer to call it, a “Business In A Box” Package. This is a big jump now to full on, Ultimate Tinting professional. So what's the difference between a “franchise” and a “Business In A Box package”. Well all the good bits of a franchise, without the tying, restrictive, expensive contracts.. Very simply, in an ideal world, you come to us for your initial training, you get trained, all your dedicated marketing material, banners, invoice books, pop ups & uniforms, plus everything else, is waiting for you. 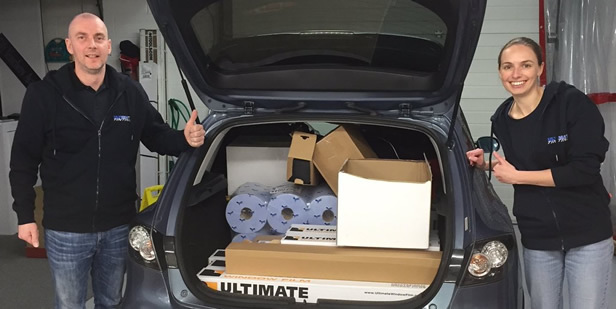 You load up your car with everything, you go home and set up your tinting business. “It can't be that simple” I hear you say. Nope, it really is, just ask any of our guys, this is exactly how they've done it with them. It works... We just get more involved with you from the very start, we've even been to check out units with some of our guys, to make sure they're suitable. Several of our professionals, even work from home. This works very well as it keeps the overheads down. Richard from Ultimate Tinting Nottingham is one of our most successful guys, he works from home, just check out his testimonial below. FROM 7 YEARS AGO!!!! You'll receive quality business cards, fliers, invoice books, and brochures all customised to you. 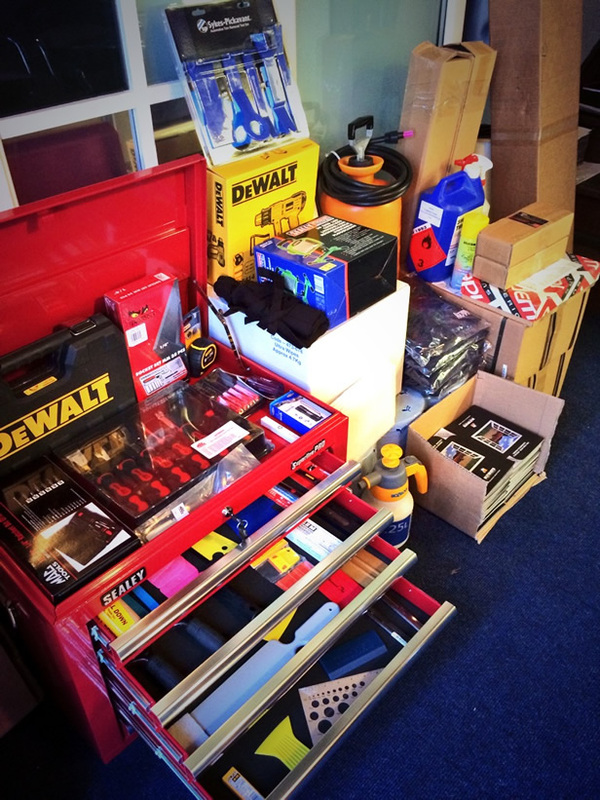 You'll get Snap-On or MacTools and DeWalt tools, all the dedicated tinting tools you'll need and a big, quality, tool box to keep them all in too . Paper towels, solutions, water bottles, 60” film handler (This alone is over £750), rulers, tape measures, heat gun etc etc etc. Loads of stuff, and finally about 10 rolls or window tint, which is actually, theoretically enough to make your investment back with!! You’ll receive as much advice as you need up to the point where you can stand on your own 2 feet, but also full, on going support. BUT don’t expect me to run your business for you, it’s YOUR business and if you run it to my model it WILL work. Now with FREE 4 day car wrapping course..
YOU WILL BUY THIS COMPUTER CUTTING MACHINE AND PAY MONTHLY FOR THE PRIVILAGE. I don’t ask for a cut of your profits. I advise you where to buy film from not force you buy from a certain place. I won’t force you to buy any unnecessary computer cutting equipment. You can operate under the "ULTIMATE TINTING" trading name. You will receive enough film included in your package to make back the cost of your franchise. All I ask is for a small fixed monthly fee, to cover your listing on the site, the internet advertising and on going development of marketing material. To give you an idea this fee is about the same as the profit from ONE car tint A MONTH! A bargain yes? So I've applied all the best bits I've learnt over the years, improved it, halved the price from our time with the “Franchise Doctors”, so it now costs £12,995 +VAT and er, gone for it, and 7 years on we're still going form strength to strength, probably have one of the best names in the industry and are recognised nationally. Seriously, if you choose to go down this, the first thing to do is lets have a chat, then come and see us, bring your partners, bring your parents, bring your business advisor’s, it's VERY important that you have your family supporting you with your new venture. Once they've met us, that usually dispels their concerns. “After talking to various company's regards window tinting courses i got in contact with Tim were he spoke in great detail about the different options he could offer ie: Tint course or wrap course then he mentioned the “business in a box” which basically had everything i needed apart from some premises to start my own business. After talking to Tim a couple more tims me and the wife had a drive down to see him which i recommend. After final talks we decided to go ahead with the “business in a box”! After securing my unit and getting a couple things in place i headed off to do my training with Tim and Jon which was fantastic. Now I'm here a year on trading as Ultimate Tinting Hull, i have full support from Tim and Jon when needed also i use the private forum we have, for all the advice on most cars available which is fantastic a real life saver at times! I now earn more a day than i did a week at my last job! A good day at the moment can be around £800+ depending on type of vehicles you have in that day but i also average around £300-£400 a day which is two average cars. I also attended the yearly meeting were i learnt so much talking to the other guys there picking up many tips to help when i got home! I have recently finished my three-day tinting and one day flat glass course with Ultimate Tinting and I wanted to write a few words to help other people that are looking to get in the tinting business, I have always had a passion for cars after working in the motor trade for seven years I took at career change leading me in to the emergency services, since working there I have realised that working with cars is what I wanted to get back into, I started looking into tinting courses and I found a few different companies offering there services, thankfully I did my research as I realised there are a few companies out there that are advertising the tinting training courses but most of what there are offering isn't as they say, their hard, pushy sales technique nearly had me sign up with them. Then I found a company called Ultimate Tinting and after speaking to Tim, he helped me a great deal. I went down to Wales to meet Tim and we had a good talk this is when I decided to do the business in a box. The training, advice and support that I have received so far from Tim is fantastic. All I can stress is do your research and contact people that have already done this and get there opinions and feedback you will soon realised that there is only one company for this, Ultimate Tinting. "I was made redundant in April after spending over 30 years in the Motor Industry mainly in technical training and management positions. Despite my concerted efforts I failed to get permanent job offers - I was either; too old, too young or over qualified or under qualified. My confidence and savings were dwindling. After much deliberation and sleepless nights I decided to go it alone and start something on my own. But it had to be a venture that I could control and maintain without some one else calling the shots. It had to have a short but intense training period - after all I had a mortgage and bills to pay (and an extravagant wife), something that would not cost a small fortune to set up, a professional and easy to use website but most importantly, I knew I would need back up and help. I looked at several business opportunities within the Motor Industry. The one that appealed to me most of all was Window Tinting, mainly because there were three streams of business - car, residential and commercial. I was tired of an office / managerial type job and wanted a more hands on role. I asked friends and colleagues to comment on my attributes - an excellent communicator, a person with a good reputation and who can be trusted, a hard worker and some one always up for a challenge. I made several visits to Window Tinting web sites, arranged meetings with franchise window tinting companies but remained unsure and nervous of taking the first step of starting a new business. Large investments, high monthly franchise costs, additional and some unnecessary advertising costs and too many ties made me nervous and I did not have total trust in the companies involved. They seemed more about what was in it for them. I then made contact with Tim Haywood at Ultimate Tinting. Tim invited my wife and I to his premises in Ruthin, Wales. We talked, asked loads of questions and I had a go at tinting for my first time. Tim filled me with confidence - he was honest, up front and very supportive. 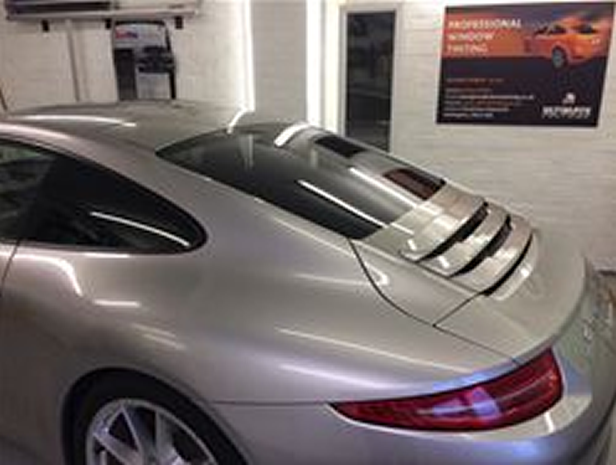 He had years of experience of tinting windows; he also ran a tinting training school and had a brilliant website that he could customise just for us. I knew from my training background that in order to train you had to know the subject inside out. Tim offered me a "business in a box package" which fully met all my requirements. I attended a 1-2-1 training programme and by the end of the fourth day I was tinting and shrinking film on some difficult vehicles. I was very impressed with the training I received and I left the course feeling confidant and could not wait to start tinting. I immediately started tinting cars and, on Tim's orders, practiced over and over. I set up my business (with a lot of help from Tim) and began trading as Ultimate Tinting Nottingham. Tim supplied me with all the tools and equipment I required. He also supplies me with a good quantity film - but says if I can find as good a quality film cheaper let him know but I know I won't as Tim researches everything thoroughly! Tim was always at the end of the phone if I required help or advice, which was reassuring. I advertised in local monthly magazines and work started to come in, word spread - first cars, then a narrow boat and the conservatories, what a challenge!! Business is growing and I enjoy my work and have no regrets." The success these guys have achieved has come because of 2 main reasons. Following our way of doing things BUT more importantly, their own hard work, and it is HARD WORK. So what can you expect once you're established? Below is a fictitious example of a busy week, once your up and running . However, even though it is fictitious, it is based on what actually happens and there is absolutely no reason why this shouldn’t happen, and more, once you’ve got yourself established. The Total hours are based on how long it would take me to do the work. The job descriptions and how they come about are very very common and happen all the time. Hyundai Santa fe, To protect the kids in the back from the sun. From the web-site £240.00. BMW, 5 series touring M-Sport. For the looks, referral from previous customer £280.00. Price up a conseratory job on way into work. Seen the advertising on your van in Tesco’s. 2 X Range Rover sports from a local dealer £520. Internet search, regular work now. Provide privacy tinting for Office other side of town,£600. From BNI networking meeting. 2 X van rear windows. £120 . Did his personal car last month now wants privacy film for his works vehicles. Vectra Estate £240.00 , From a leaflet at the vets. Range Rover from the dealer £280. Vauxhall corsa £180 , friend of a customer 6 months ago. I’ll let you add that up, and the hours, and call me and I’ll give you the price of the film you’ve actually used. You’ll be amazed. These aren’t pie in the sky figures, they’re taken from a busy weeks work. But hey, say you only get ¼ of that, that is still serious money. You see how it works? This won’t happen over night but it does happen, over and over again, week in week out. Yes you do get quiet weeks but who doesn’t. Even if at the start lets say you ONLY get 2 average cars a week, that’s £440.00, how long does it take you to earn that now? That’s an easy mornings work. Some people think this is a get rich quick scheme, it isn’t, it takes a lot of hard work, lots of blood, sweat and tears, particularly at the start while your finding your feet, but work through it and you will get there. Here’s another couple of ways of looking at it. Valeting, HARD WORK, how many proper, full valets you can do in a day? 3 lets say 4. That’s a competitive market so the most you can charge is £40, no say £60 each, so your ceiling for earnings is capped at £240. That’s the most you can physically earn in a day without being silly and working till midnight. That’s a hard days work, trust me, my first stab at being self employed was as a valetor. Anyway, that’s assuming you have 4 cars in and are able to charge £60 each. If it’s only 2 full valets at £40 each, that’s £80 for a days work…£240 is the same money as a Focus estate tinted in just over an hour!! Wheel Refurbishment and dent repair. What can you charge for that? £20-£40 a wheel. £20-£50 a dent, even flat out you’d be VERY lucky to do more that £250 a day there. I think you’re starting to see where I’m coming from now. With a lot of businesses out there, there is a physical ceiling to the amount you can make in a day, and you’d have to work bloody hard, day in day out to make decent money. Also it’s very hard to up sell in the majority of these businesses. This is where you provide a service for your customer then when you’ve done that service, you can sell them another of your services. As an example, once I’ve tinted someone’s car, I’ll ALWAYS leave one of our excellent residential tinting brochures in their car for them to read. Sometimes you’ll get a phone call a couple of days later saying “ I’ve read your brochure, what a good idea , never thought of that. Can you please come and give me a price to do our conservatory”. Because you’ve done a good job on their car, they already trust you, your 9 tenths there. See how it works. Wheel referb’ guys, what is your target and ONLY market? People with damaged alloy wheels. Valeting guys, who is your target? People with dirty cars and if your adventurous you might do the odd carpet or curtain. Window tinting guys, who are your target customers? ANYONE WITH GLASS, you show me a piece of glass and I’ll give you a reason to film it!! This is such an interesting business to be in, everyday is different and you get to see some wonderful and interesting things and meet some great people. For more information on any of the above, just call me for a chat or even come and visit me which would be better. As I’ve said before all my testimonials are up to date and TRUE!!! Please do speak to some of the guys who’ve done my courses, for your own piece of mind.